From Rome (A1), Bari (A16) and Salerno (A30), it is a good idea to reach the port in NAPLES – and leave from the CALATA PORTA DI MASSA pier (by ferry, from the “varco Pisacane”). It is not necessary to take the bypass (tangenziale) but follow the directions to reach the ZONA PORTUALE (PORT AREA) and after taking the exit, continue in this direction towards the port, that is approximately 5 Km from the bypass. In order to reach the port in Pozzuoli, closer to the island, follow the directions for the BYPASS (TANGENZIALE) and continue in this direction towards POZZUOLI, take the VIA CAMPANA exit (n.12) and continue along this road, heading for the PORT in POZZUOLI (only ferries) that is approximately 4 km from the bypass. Napoli Campi Flegrei: from here, it is easy to reach the port in MERGELLINA, approximately 3 km from the railway station. Napoli Mergellina: the railway station is approximately 200 m from the port in MERGELLINA. Napoli Centrale and Napoli Piazza Garibaldi: In reality, both railway stations enable immediate access to Piazza Garibaldi, approximately 4 km from the NAPOLI BEVERELLO port that can easily be reached by TAXI. 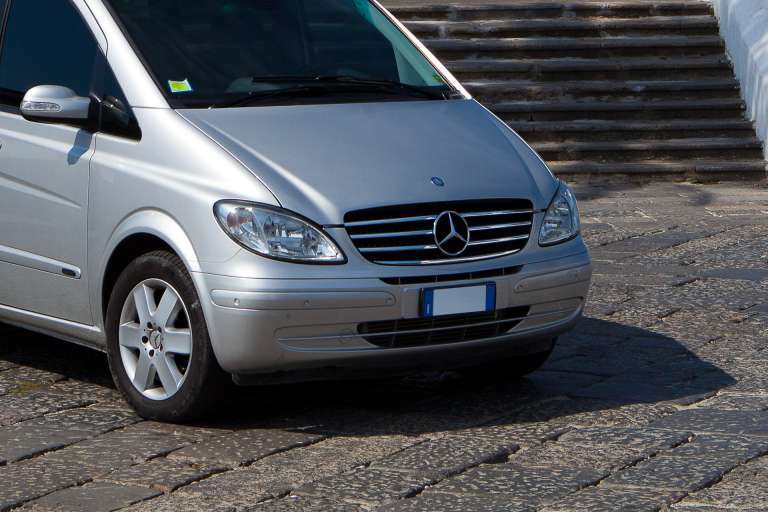 From the NAPOLI CAPODICHINO airport, it is possible to reach one of the two ports in Naples by taxi in 20-30 minutes. There is also an ALIBUS public transport network that directly links the STAZIONE CENTRALE (CENTRAL RAILWAY STATION) and the NAPOLI BEVERELLO port and which runs frequently every 30 minutes from 5:50 a.m. to 11:30 p.m.
Once you arrive on the island, follow the directions for the ARAGONESE CASTLE. By taxi: Taxies are continually available at the port. 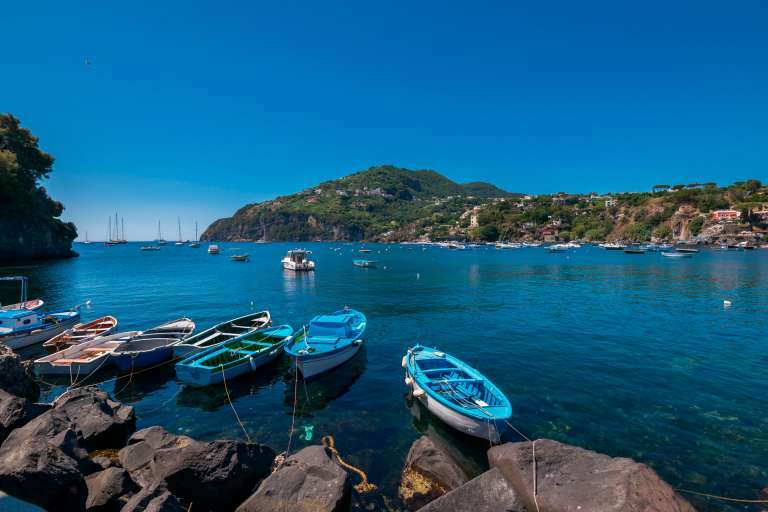 Ischia Porto is approximately 1.5 km from Ischia Ponte. By bus: The bus terminal is right in front of the port. 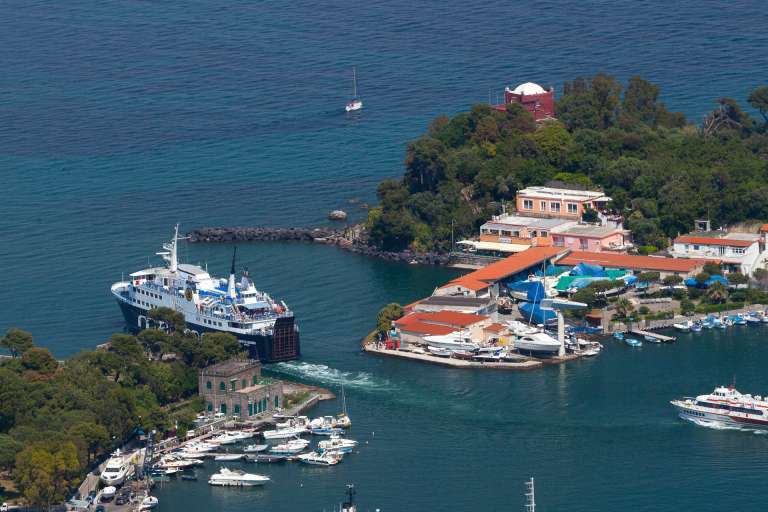 Bus n. 7, which directly links Ischia Porto and Ischia Ponte can be reached in 5 minutes. Get off at the last stop in Piazzale Aragonese opposite the Aragonese Castle. Villa Lieta is behind you. Private car with driver: It is possible to avail of the services of the driver service upon request.